Post tournament note: Congratulations to Geoff Ogilvy, who became the SBS Championship's ninth consecutive international winner (and a repeat champion as well), with an impressive winning score of 22-under. 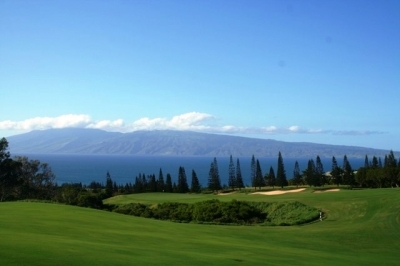 KAPALUA, MAUI, HI – A lot of people see January as a depressing month – it marks the end of the holiday season, it represents the beginning of another long work year, and for those of us in the east, it’s probably the coldest part of winter. No wonder folks feel a bit down when the calendar turns. But on the positive side, January also represents a slew of new beginnings, including the start of another PGA Tour season – and what better way for snowbound golf fans to ‘warm up’ than to watch the pros tee it up in sunny and heavenly temperate Hawaii at the SBS Championship (formerly known as the Mercedes Championships), played at Kapalua’s Plantation Course (on the west coast of Maui in Hawaii). 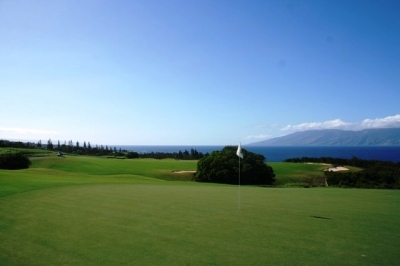 There are many reasons to tune into the SBS Championship every year, not the least of which is the opportunity to see most of the tournament winners from the previous PGA Tour season take part in a special event with an obviously limited field. Needless to say, these guys are a collection of players that know how to win – and henceforth the tournament’s acquired a reputation for great drama and spectacular shot-making over the years. 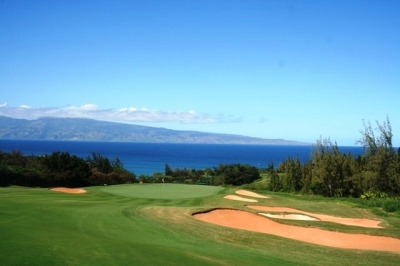 I asked Bill Coore (who co-designed the Plantation Course along with partner Ben Crenshaw) if he was taken aback by the low scores shot nearly every year at the SBS Championship, and he quickly replied that he wasn’t surprised in the least. 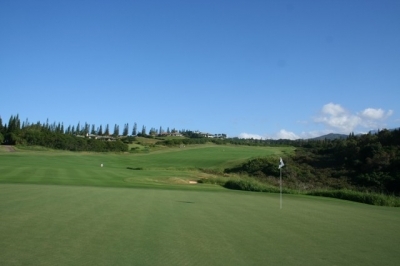 Coore also pointed out that players are often at the top of their games when they come to Kapalua, specifically referencing South African Ernie Els, who blistered the course in 2003 for a record 31-under par. Els was probably the world’s second best player at the time, so watching him shoot the lights out wasn’t a big shock, even at a course that would appear to be as difficult as the Plantation Course. Coore thinks playing the ball on the ground as well as the air is especially important on the Plantation Course, and that’s one reason why international players have been so successful in recent years at the SBS Championship – capturing the last eight tournaments in a row (the last American winner was Jim Furyk in 2001). 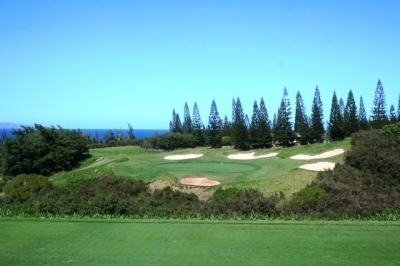 Advancements in equipment technology have also had a role, making the Plantation Course play a little differently than it was originally designed for. 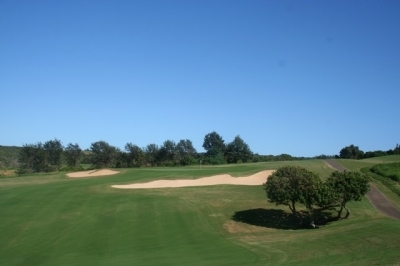 Some players (such as Els in 2003) have been able to use slopes that were thought to be inaccessible off the tee to add a lot of distance – and it’s shortened holes like the par five 15th considerably. 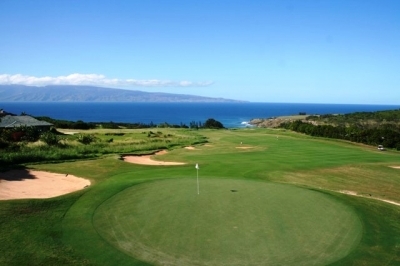 “And there are many spots on the Plantation Course where you don’t want to hit it too far – often times the further you hit it the more awkward the lie is to hit a short iron to a green that’s tilted pretty severely and perhaps not necessarily in your favor,” Coore added. A good example is the long par four first hole, which slopes dramatically downhill and there’s usually a stiff wind at your back. 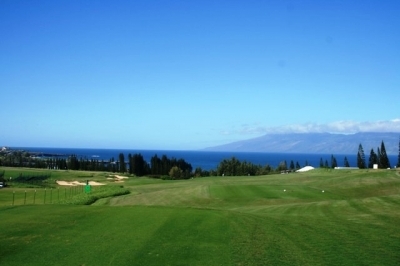 The pros play it at 520 yards, but the cart’s GPS recommends clubbing down off the tee even for resort players – or you could roll through the fairway down the slope (I know from personal experience). 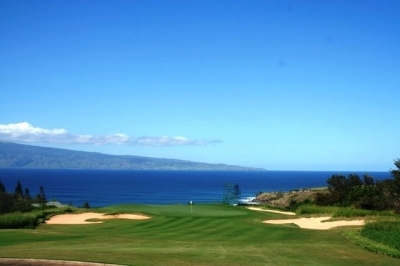 The pros play the par four 1st hole at 520-yards, but the tee shot is downhill and with the prevailing trade winds - so it's a lay-up club choice for most of them. 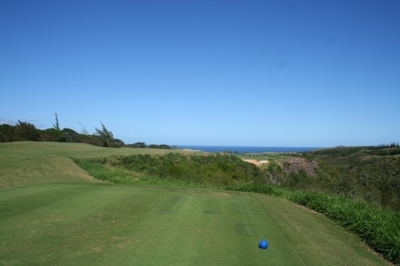 It's hard to tell from this view, but the par four 13th hole's green is severely sloped towards the ocean, which just adds to its challenge. The view from the 6th tee box is nothing but intimidation - but like nearly all the holes on the Plantation Course, there's a more than generous landing area. The long (508-yards) par four 17th hole is rated the back nine's most difficult hole - and if your tee shot is not in the right place, it's a lay-up for the second shot. We always see a lot of the par three 11th hole during the SBS Championship - and its postcard views amply demonstrate the reason why. The 7th hole is another of the Plantation Course's long par fours (516-yards) - but if you play the slope and wind right, it's a very manageable hole. Here's a look from the TV tower in back of the short (305 yards) par four 14th hole - one the pros look to birdie every time out. A large ravine separates tee and putting surface at the par three 8th hole - and the green's tough to hit if the wind is blowing hard. The par four 13th hole is one of only a few links at the Plantation Course that plays uphill and dead into the wind, making it one of the harder holes on the back nine. Here, the view of the second shot. This is the view the pros (and the fans) have looking back up the par five 18th hole - certainly one of the most spectacular finishing settings on the PGA Tour.